To be an improvisational piano trio and NOT sound like a Cecil Taylor Unit is a feat in itself. 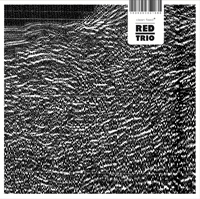 The Red Trio (Clean Feed) (Rodrigo Pinheiro, piano, Hernani Faustino, bass, Gabriel Ferrandini, drums) accomplish that feat. Yet in their own way they are playing an equally uncompromising free improvisational music that offers plenty of attractions and musical signpost to guide the listener on his or her way through the set. The trio basically either plays with a full-out, tutti sort of free attack, or scatters the sound in more meditative meanderings. Pinheiro gets inside the piano to mute the natural sustains, plays in the extreme upper and lower register, bows piano strings and thunders away with gargantuan clusters of sound. The rhythm section keeps pace with well executed, out-of-time cascades and a solo bass moment of note. There are passages of intense quiet and intense loudness. Nothing sounds tentative. Nothing sounds pretentious. Everything sounds. Red Trio rings out pure and true.